This beautifully written and superbly presented book details the proud history of the Australian Inland Mission (AIM) and its successor Frontier Services which have been providing a wide range of support services in the outback for 100 years. 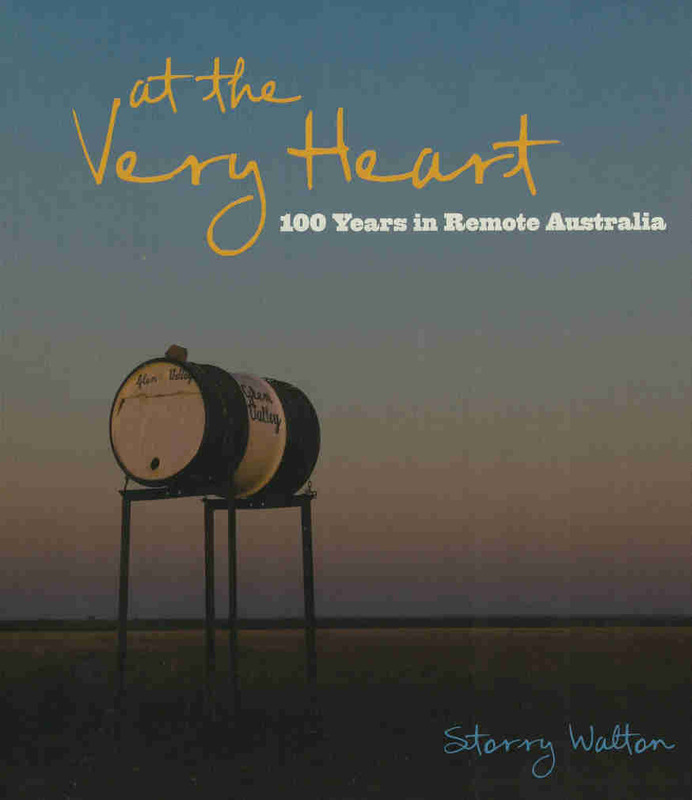 At the Very Heart is also a lively album of pictures and stories about Australia’s remote outback, largely hidden from the view of most Australians by time and distance. Together they make a grand narrative of people who were struggling to make a lonely living in some of the most remote places of the inland. At the same time it shows how we as Australians have seen, and responded to, our remote and rural places during these hundred years. The story starts with the Rev. John Flynn, who after his ordination went to the Smith of Dunesk Mission in Beltana in 1912 to take up his posting with the AIM. To the first settlers the outback, or inland, was a place beyond experience, a kind of void, and disappointment. Even so, by 1912 they had pushed out into country, sometimes up to 600 kilometres from medical assistance or a day’s journey from their nearest neighbour. Many lived thousand or more kilometres from any service and so remote that there was little or no hope of help in time of sickness or accident, and no basic amenities. It was the AIM that devised ways of overcoming the tyranny of distance and its very real perils. As late as 1927 there was no medical practitioner for a distance of 2000km south to north from Oodnadatta to Darwin and east to west for 2500km from Cloncurry to Roebourne. Under John Flynn, the AIM was to draw the technologies of radio and aviation together to create a revolution in inland communication and safety. He saw the courage and the frequent tragedies in the lives of workers and families who were among the most remote people in Australia. When he arrived at Beltana there were no roads, no wireless communication, no neighbours, no shops, no home comforts, no doctors, nurses, hospitals or schools in the inland. Camel, road and rail transport were often few and far between resulting in mail and supplies only delivered once or twice a year. Jeannie Gunn of Elsey Station, in her book, We of the Never Never, recalled how after the mailbags had been delivered, all would be very quiet as people retired to private corners to read, then re-read and read again their precious letters from far away. Flynn’s vision for ‘a mantle of safety’ became synonymous with the unjudgemental friendship offered by the churchmen, both lay and ordained, who he appointed as padres. At the same time, the nurses he recruited were able to provide the most fundamental health care services, providing the confidence women needed to settle in the lonely places of the inland. He sent them off to provide the practical support people so badly needed. What was so special about the AIM was the fact that it never expected people to come to it, rather, it travelled out to people wherever they were. The only things it ever built were hospitals and nursing posts. It assisted people of all faiths and of no faith. Flynn’s first nursing home built in Oodnadatta in 1911 under the Smith of Dunesk Mission was transferred to the AIM in 1912. It was followed by another at Port Hedland, 4500km away in 1915 where Sister Linda Rutherford became the first AIM nurse of the Pilbara. By 1932 as many as 13 hospitals were completed. They were staffed by Nursing Sisters who were all practical, kind, dedicated, caring, resourceful and skilled. Some or all of these qualities are easily recognised from a diary Deaconess Sister Latto Bett kept during her time at Oodnadatta. One entry tells how early one morning she received a message from a travelling railway doctor that there was a seriously sick child at William Creek. She packed a few things in a basket and a friendly railway lineman offered to take her the 125 mile journey south on the open motor rail tricycle used by gangers. She wrote that despite the sight of hundreds of drought-dead-cattle the journey was on the whole quite pleasant when you take into consideration the fact that you have to sit very still in one place without a back rest or an umbrella to shelter from the sun. The linesman made the trip in a record eight hours. Latto Bett added that it was also unique in that it was the longest distance a woman had travelled on one of these motor tricycles. She attended her little patient successfully and prepared to leave on the long trip back’. However, the story does not end there. ‘As she prepared to leave, a rider galloped into the camp with news of a badly injured stockman 50 miles out. Latto immediately organised a buggy and rider and set off. That night the horses bolted and the swingle-bar broke. Dust had obliterated the track in places, and four times they took the wrong, unmarked fork, searching each time in pitch darkness with hurricane lamps for the track. They arrived at the camp at dawn and she brought the stockman slowly and carefully back to Oodnadatta. On arrival she found a new patient waiting. He had travelled by buggy from the Arltunga diggings over tracks so rough it had taken three weeks to make the journey. She attended him and then accompanied him on the Ghan, a slow 800km train trip to the hospital in Port Augusta. Arriving back at Oodnadatta, she found a man waiting for her in serious condition. He had come in 600km alone on camel-back in temperatures of up to 50 degrees. She nursed him day and night for a week. But he died. She conducted his funeral in a dust storm’. Many of the extracts from diaries and memoirs in the book have not been published before. However author Storry Walton found these accounts redolent of the laconic wit of people in tough circumstances. They include moving stories of love, survival, duty, and resilience, the wiry qualities that have kept inlanders going for a hundred years. Sisters Grace Francis and Catherine Boyd took 16 days to travel from Brisbane to Birdsville in September 1923 to take up appointment at the newly opened hospital. Three years later Sister Jean Finlayson rode 650km on a camel from Oodnadatta to establish a nursing home in Alice Springs. In 1929 the Innamincka Hospital was opened and staffed by two Sisters. Sisters Dorothy Church and her friend Phyllis Hughes, who opened the Leigh Creek AIM hospital in 1945, worked among 12 families and more than 200 single men, Displaced persons, of all nationalities and languages! Being an AIM Nursing Sister was certainly not for the fainthearted! It is worthwhile to just reflect for a moment about camel, horse and buggy transport and compare it with the modern day 4WD, or Traeger’s pedal wireless with the mobile phone, the telegraph and its Morse code with laptop computers, mobile broadband and text messages. One can only wonder how people managed, but they did. It was Alfred Traeger’s pedal radio that helped Adelaide Miethke to establish the world’s first school of the air in 1950. It is no wonder Her Excellency Quentin Bryce, AC, CVO Governor General of Australia wrote, ‘It is important for all Australians to learn about Flynn’s vision, Traeger’s pedal radio, and the establishment of the AIM. No other organisation had such an impact on the development of Australia’s Inland’. It was John Flynn’s hard work which led to the creation of the world’s first aerial medical service in 1928, now known as the Royal Flying Doctor Service. Flynn was also a fine photographer. He took thousands of glass negatives from rural and remote Australia when ‘the struggle between nature and human kind was still raw’. He captured moments of their lives and the physical nature of labour with a keen observant eye. Unwittingly he left a superb historical record, no less important than that of Hubert Wilkins, Paul Foelsche or George Aiston. Many of his pictures tell more than a thousand words could. Flynn was also aware of the problems faced by the ‘Old Timers’ of remote Australia. It led him to establish what has become a significant age-care community in Alice Springs. With the help from Colin Ford, Fred McKay and many others he hand-built the first cottages which paved the way for what is today a sophisticated complex of residential aged-care facility, a day therapy centre and 46 cottages and independent living units. After a long live in the bush Rev. John Flynn died in 1951 and was succeeded by Rev. Dr Fred McKay. Five years later the cathedral of the outback, the John Flynn Memorial Church was opened in Alice Springs ‘as a memorial to the man whose vision had left the outback so much richer’. In 1977 the work of the AIM, the Federal Methodist Inland Mission and the Home Mission of the Congregational Union were united and became Frontier Services. Frontier Services has continued to provide patrol ministry across 85 per cent of Australia or some 7,000,000 km². Its nearly 1000 staff provide over 120 services including age and community care, nursing, counselling, migrant services, family support and a range of children’s services. Where others have said, too hard or too far, Frontier Services asks how and when. Frontier Services has become the major provider of age-care in the Northern Territory. It manages Indigenous aged-care facilities only by invitation and does so in collaboration with the communities. It has, and still does, helped families and the elderly in numerous physical and pastoral ways and responded in positive ways to meet ever-increasing demands relating to mental health and depression in rural and regional Australia. Frontier Services is to be congratulated on its care and numerous facilities it has provided during these 100 years. Rev. John Flynn would have been justifiably proud of its successes, as should all Australians. To be able to carry out these numerous responsibilities Frontier Services has had to rely on those citizens, private and corporate, who have understood the inconspicuous way it works. For a hundred years individual supporters have come forward in large numbers. The first corporate sponsors, HV McKay and Sir Sidney Kidman have been followed by scores of others. But the need still continues. and its successor Frontier Services, is to buy a copy of at the Very Heart. and historic black and white photographs.